No. of Blocks: Two, with 10-floors per block. 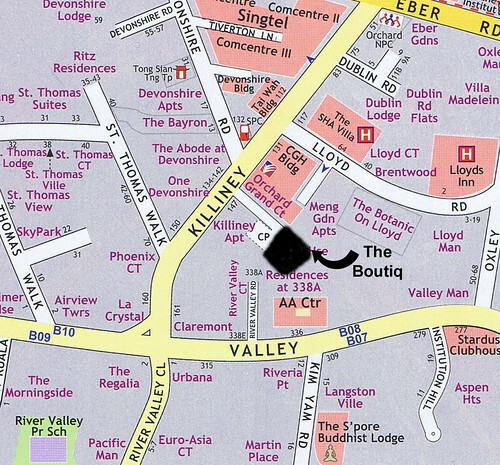 The Boutiq is a luxury “boutique” developments located off Killiney Road in prime district 9. The project was launched in April and was very well received – a total of about 110 units were released so far, of which around 90 units have already been sold. 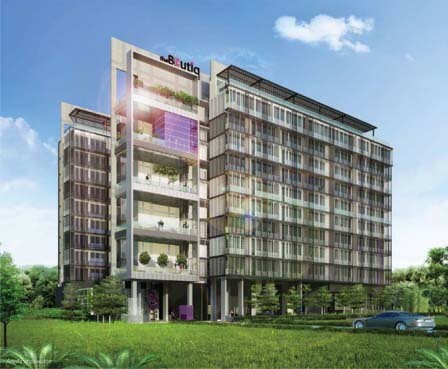 The Boutiq is developed by Unique Development Pte Ltd – a consortium comprising Heeton Holdings, KSH Holdings and TEE International. These are the same developers that have launched projects such as Lincoln Suites, The Lumos and iLive@Grange. The Mitre Hotel - which opened in 1948 - was at the centre of a 12-year-long legal tussle between the landowners and the hotel proprietors. The case was finally closed in February 2008 when a court ruling ordered the sale of the property via public tender and the occupants to clear out. 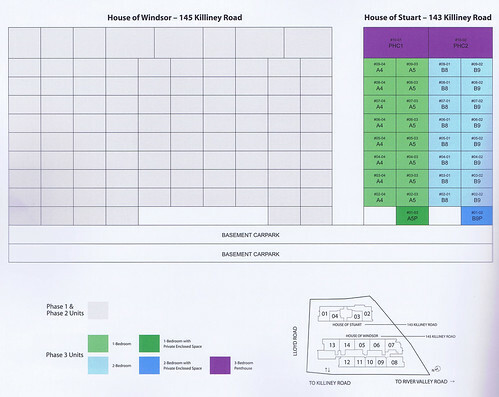 That paved the way for the consortium to purchase the 39,972sqft freehold site in March last year. 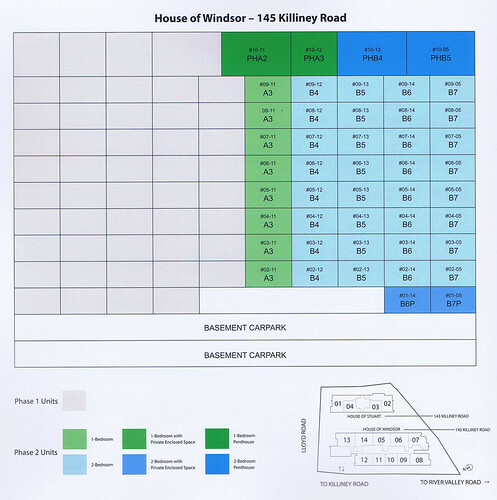 The sales gallery of The Boutiq is located at the actual site itself, which is behind what was formerly Killiney Apartment (or the soon-to-be-built Residences @Killiney). An access road from Killiney Road will lead you to the entrance of project. 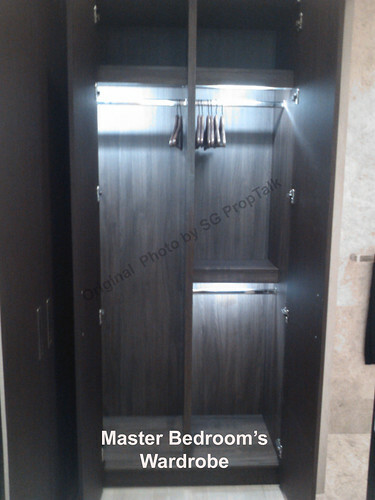 You may also be interested to know that the PES of some ground-floor units can go up to 500sqft. Facility-wise, The Boutiq is being marketed as a “full facility” condo – minus tennis court. But given the small plot size, there are only so much the developers can squeeze into the project in terms of facilities. But the main feature must be the 5 “Sky Gardens”, which is located one on top of the other in a dedicated stack (facing the main entrance) in Block 145. 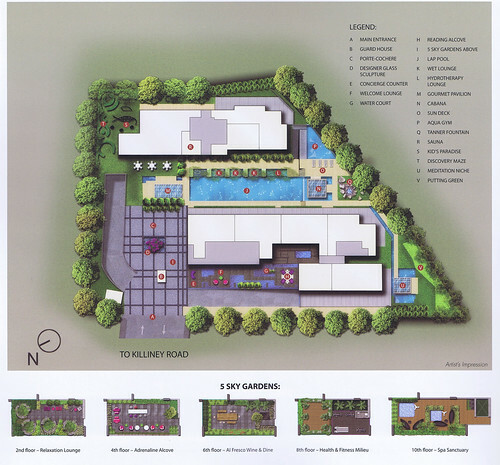 Each sky garden comes with its own theme and facility offerings. Parking lots are located in the 2 basement levels. However, the usual ‘1 parking lot per household’ applies. There are 2 showflats on display at the sales gallery. 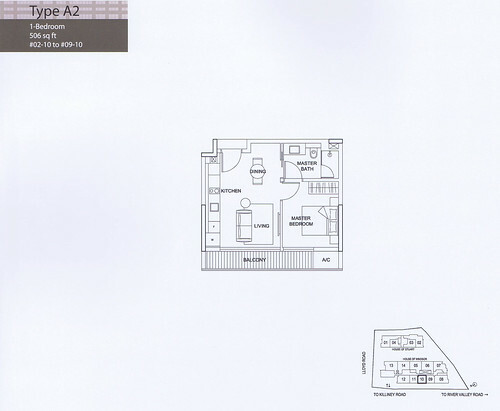 For our review purpose, we will stick with the 2-bedroom showflat. 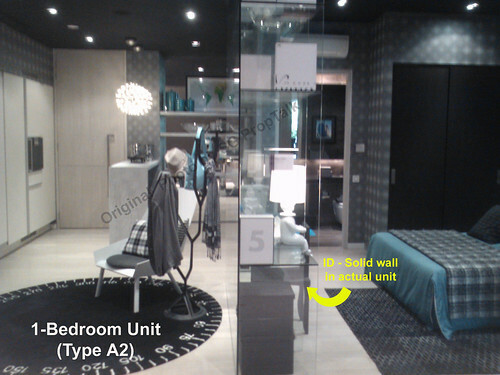 For those of you who are not interested in ground-floor units with lots of PES, you be glad to know that the layout for the typical Type B3 units (2nd floor and above) is exactly the same as Type B3P minus the PES. The size of a typical Type B3 is 819sqft. As you enter the unit, you arrive into the living/dining area. The area is rectangular shaped and actually quite good-sized; this especially considering that the whole unit is only about 800sqft. You get 60cm X 60cm marble flooring and 3-metre ceiling (4.5m for the ground-floor units). One question that immediately came to mind was: where is the kitchen? The answer to that question is: there is none! 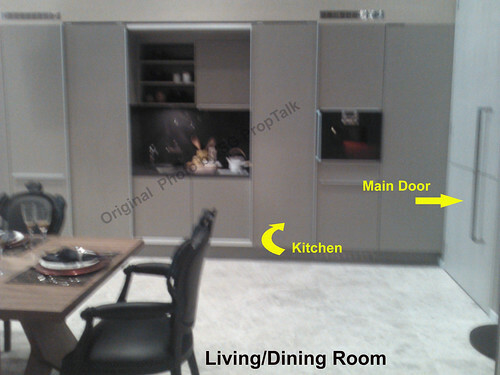 The "kitchen" is integrated into the set of cupboards that lines one side of the living room wall. You get a set of "Gaggenau" induction hob and hood, fridge, washer & dryer (stacked one above the other) and "Hansgrohe" faucets. The wife and I quite like this "pseudo" kitchen concept, as it saves you space while providing you with the kitchen basics for you to do some light cooking. This is taking the assumption that owners of such smaller units will normally not do any major "heavy duty" cooking. But the downside is that you will have to do your laundry in the living room. 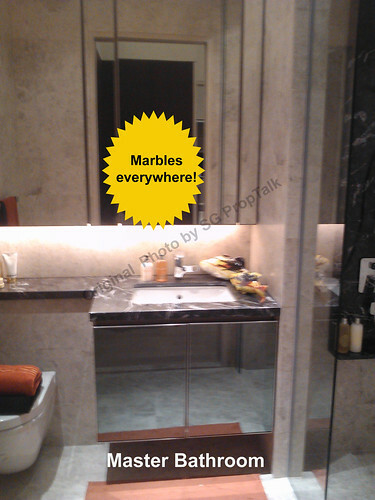 The common bathroom is decent size and comes fitted with marble floors/walls, "Hansgrohe" taps and "Duravit" toilet. The shower stalled is equipped with a rain shower, which is rather uncommon for common bathroom these days but a pleasant surprise to us. The common bedroom is regular shape but tiny, so it is a good thing that units in The Boutiq doe not come with bay windows or planter boxes. You get nice timber-strip floors and supposedly designer wardrobe from Atelier. 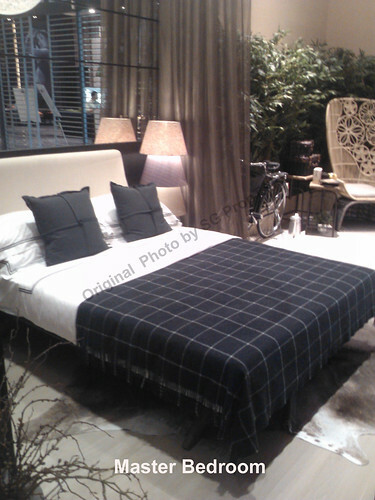 The Master Bedroom is small - you probably can only use a Queen bed if you still want some walking space around the room. The designer wardrobe from Atelier looked rather ordinary and somewhat dull. 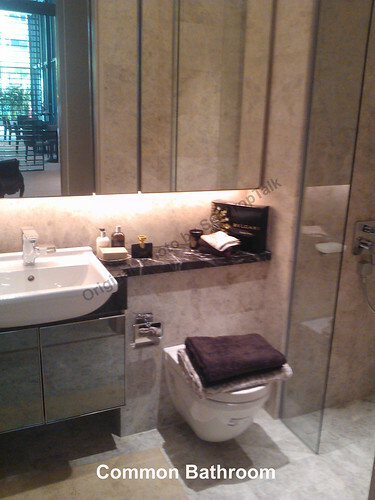 The Master Bathroom is quite good-sized and is almost a replica of the common bathroom in terms of look and fittings. Standing shower is the order of the day so those expecting a bath-tub will be solely disappointed. • The site where The Boutiq sits on is rather exclusive, as it is tucked away from the main road. So you are somewhat insulated from the hustle and bustle of Killiney Road (and the ensuing traffic noise) and yet just a short walk away from the food and amenities. • Location, location, location - one cannot argue about the convenience of The Boutiq, both in terms of its proximity to Orchard and CBD and the vast selection of F&B (ranging from fancy restaurants to coffee shops) along Killiney Road. There is also a NTUC in the building next door as well as a petrol station (SPC) directly opposite. The Somerset MRT station is about a 10 minutes' stroll away. 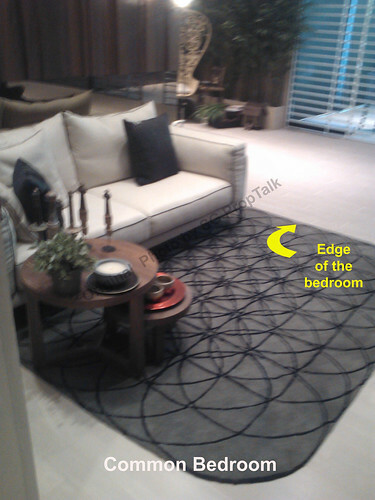 • The quality of fittings and furnishings as shown in the showflats are certainly befitting of a high-end project. We also like the "pseudo kitchen" concept as mentioned earlier. • Parents with primary school-heading children will be pleased to know that River Valley Primary (co-ed) is definitely within 1-km of The Boutiq. In fact, your kid (with the maid in tow) can literally walk to school. • The Boutiq's site, while exclusive, is surrounded by buildings on all sides. Thus, it can get a tad claustrophobic and there is really not much of an "external view" to speak of, unless you are staying on the 8th floor or above. As such, potential buyers of lower-floor units will probably be better off with inward, pool-facing units. • The distance between Blk 143 & 145 is a mere 11 metres apart - too close for our comfort. So some of the inward-facing apartment units in the 2 blocks will probably look into each other, in addition to the lap pool. • For those who are particular about "Feng Shui", stack #12 may be a potential problem if the access road actually "cuts" into your unit (i.e. a direct line of sight from your unit). 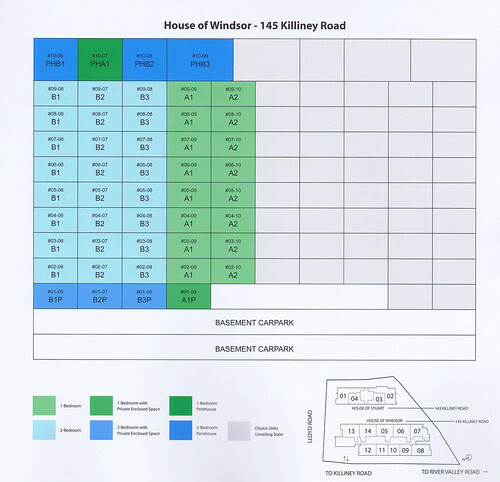 The current site plan indicates otherwise so let's hope the developers are accurate with their building plans. Our verdict: There is definitely more positives than negatives as far as The Boutiq is concerned. The price tag may put some people off, but at least you are getting quality for the money you shell out. However, there must be better alternatives to earn the 3% return on rental that the project will supposedly get you - the wife and I were told that the expected rental for a 2-bedder unit is around $5k. No Comment to " The Boutiq @Killiney (Review) "